UTSA Roadrunner Days – Get Here, Get Involved, Get Rowdy! In honor of UTSA's 50th Anniversary in 2019, we're hosting Roadrunner Days Spring Edition - two weeks of semester-launching activities built around our deeply held values of student success, student involvement, community service and fun! On-campus residents can check out the UTSA Housing website or follow @utsahousing for the latest information. Grab your student ID and head over to the Convo to cheer on your Roadrunners in this Conference USA game. Get all the latest Roadrunner sports info at the UTSA Athletics website. The excitement of a new semester starts today! The friendly folks at UTSA One Stop can help with last-minute questions. Wear your UTSA Blue and Orange to show off your Roadrunner Spirit! Be sure to stop by and help us launch UTSA's 50th Anniversary celebration. Dozens of UTSA offices will host information tables, fun activities and give away lots of freebies including t-shirts, a FastPass garage parking cards, and UTSA Dining Gift Cards. “Students Come First!” at the Tomas Rivera Center (TRC) where staff support students in their academic journey through Academic Success Coaching, Supplemental Instruction, and Tutoring Services. High tail it over to any or all of our campus locations for an informal come-and-go welcome from our staff, 2:00-4:00PM. Check in with staff at all four locations and become eligible for the prize drawing! Representatives from Campus Recreation, Health Services, and Counseling will share the many ways we can help you stay healthy - both physically and mentally - so you can get the most out of your UTSA career. Hosted by the Student Center for Community Engagement and Inclusion, this casual/come and go event - open to the entire UTSA community - is a terrific opportunity to celebrate the diverse identities of Roadrunners, meet students, faculty, and staff, and get connected to services, resources, and organizations on campus. Departments, Faculty/Staff Associations, and Student Organizations can sign up on RowdyLink to have a table at the Networking Social! The UCinema Spring Season launches with Selma - a powerful selection as we head into the Martin Luther King, Jr. weekend and Monday's march. Join fellow Roadrunners as they share their UTSA spirit before the Women's Basketball game tips off. The San Antonio Annual Martin Luther King, Jr. March and celebration is the largest in the country. Join fellow members of the UTSA community as we commemorate the legacy of Dr. King's dream. 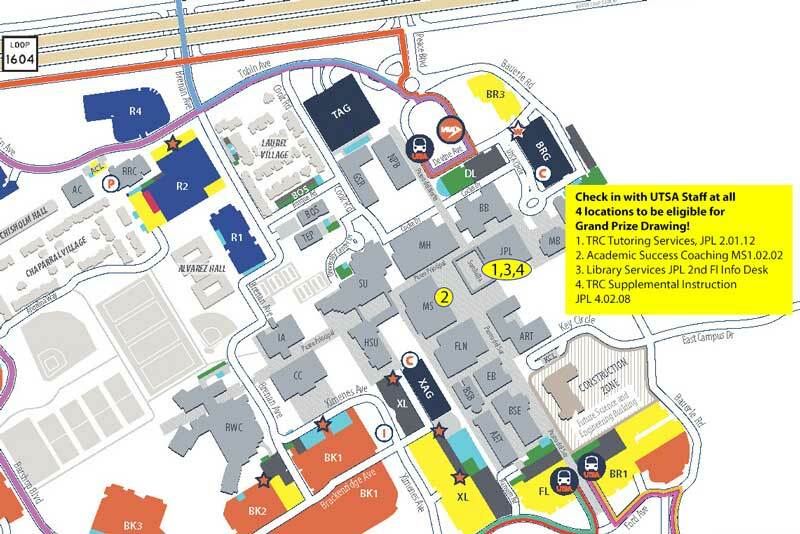 Buses will be available at both the main and downtown campuses for UTSA students, faculty, and staff. Have some fun at our Digital Photo Booth while learning about the many ways to get involved on campus. Roadrunners deeply value Volunteering and Community Service - stop by and learn firsthand from your fellow Roadrunners how you can help! Join us for the opening of Shades of Brown, by renowned artist and UTSA Alumni, Kaldric Dow - a leading African American artist of the millenial generation. Roadrunners deeply value Volunteering and Community Service - stop by and learn firsthand from your fellow Roadrunners how you can get involved and help! Enjoy live music from local artists as they perform in the Student Union’s iconic Window Lounge. The series runs monthly throughout the fall and spring semesters for students to enjoy live music in-between their classes. Want one of those chunky knitted scarves, but don't want to pay the hefty price? Then come join this Union Leisure Arts class and learn the basics of hand knitting - you may even walk away with a scarf! Don't miss this exciting, action-packed movie that many say has set a new standard for the superhero genre. If you need an accommodation to fully participate in any program or event, please contact the Office of the Vice President for Student Affairs at least 72 hours prior to the event at 210-458-4136 or via email at vpsa@utsa.edu.